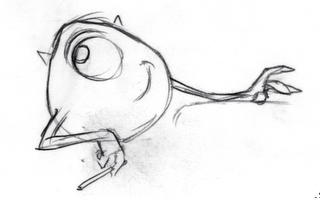 It's really interesting to see how you build your animation with this drawings! It's really nice!i like it! worried about "winging it?" Nice to know people of your caliber worried too once! wow! incredible, was a long time, I listen about you since Alien Song, you are a legend, thanx for remember and share it. k. borcz, I never stopped worrying! It keeps me working hard. You've been an inspiration for a lot of individuals, like me, who wanted to become animators. For that, thank you. Nice sketches Victor! The character in your sketches really carried through. wow man, some very nice planning drawings. I really like the Linguini ones personally. They are all so good really. I absolutely love how you flesh out these characters, even if they're simple sketches. The facial expressions are hilarious, and the energy in such dynamic poses as Mike screaming as the car door slams on his fingers is wonderful. Great stuff. Ha-ha. You were worried? Wow. It's kind of relieving to know that even the professionals face such challenges, although your work of '99 still looks just as incredible as everything else you've done. Thanks for sharing your sketches with us! Reminds of a Disney collection of stills you might find at a Disney store. Some day they will be selling these thumbnails for hundreds, maybe thousands of dollars at a Pixar store! Your an inspiration. I purchased Animation Master back in 2004 - 2005. The Animation Master website referred to your Blog, and your Blog referred to Animation Mentor, and is why I attended and graduated in Fall 2007. Thanks Victor!